You’re heading to the store to get an Xbox One right now, and need to know which games to get. Or you’re at work or in school, daydreaming about what you want to play next. Or maybe you’re suiting up for a battle in the console war, cinching on your armor and trying to remember which games will best help you make the argument for Microsoft’s new console. We’re here to help. These days there are more good Xbox One games than ever, with new contenders arriving all the time. In the list below, we’ve listed the games we recommend for Microsoft’s machine. We will, of course, continue to update the list regularly as more games are released for the Xbox One. Rise of the Tomb Raider does much of what its predecessor did: It gives us a relatable, less superhuman Lara Croft and sets her loose in a hostile environment with only her wits and a pickaxe to stay alive. While the story may not be ultimately as gripping or cathartic as the first game, the full experience is knit together very effectively, with a good mix of puzzle solving, exploration, sneaking and fighting. Things get more interesting with the game’s downloadable add-ons, too, which have Lara taking on zombies and swamp witches along with a repeatable survival mode that’s so good it could be the foundation of a standalone game. All that and the game is so beautiful it’ll often have you pausing just to take in the view. A Good Match For: Fans of Crystal Dynamics’ 2013 Tomb Raider reboot, bow and arrow enthusiasts, anyone who really hates bears. Not A Good Match For: Folks looking for a deep or nuanced story, people who hate collectibles. Watch the game in action. Cuphead doesn’t look or sound like any other video game—take one look at the gorgeous backdrops, 1930s-inspired art style, or take one listen to the Ellington-infused big band soundtrack. It plays more familiarly, a side-scrolling shoot-em-up that turns players into perfectionists. Each boss requires precision, planning, and perfect timing to defeat, and the rush of victory is like nothing else. Come for the beautiful art and music, stay because you can’t stop playing until you finally beat this next boss. A Good Match For: People who like mastering brutally difficult games, anyone who wants a video game that looks unlike any other. Not A Good Match For: The easily frustrated, those who don’t love old-school side-scrolling shoot-em-up games. Purchase From: Available digitally from the Xbox Store. Epic Games’ goofy, chaotic take on the Battle Royale formula has become a global sensation for a reason: it’s a really fun, good game. It starts with the familiar Battle Royale formula: 100 people land in a massive arena, and only one can win. Then it polishes things up with colorful characters, funny items, and a level of technical polish you’d expect from the people who make and maintain the Unreal Engine. It works great on consoles, just like it works on PC and even phones. And unlike its competitors, it has a ridiculous crafting component carried over from the base version of Fortnite. Getting shot at? Time to build a panic-wall. Want to get the drop on an opponent? Time to build a huge tower and get the angle. A constantly changing, constantly entertaining game, Fortnite Battle Royale is easily one of the best zero-dollar gaming investments you can currently make. A Good Match For: Anyone looking for some silly competition, fans of competitive online games, world-famous rappers. Not A Good Match For: Those who like to win. There’s only one winner per Fortnite match, and it probably won’t be you, at least not for a while after you start. Read our take on why we like the game. Purchase From: Available (for free) on the Xbox Store. A Good Match For: Puzzle fiends, people who like a challenge, anyone who liked Myst and wants to see what a modern evolution would be like. Purchase From: Available from the Microsoft store. Titanfall 2 gave us what we were expecting—more of its trademark fleet-footed, giant robot-enhanced competitive multiplayer. It also gave us an unexpectedly fantastic singleplayer story campaign, and that’s really what sets it apart. What could’ve been a series of botmatches or boring corridor shootouts instead was an uncommonly well-designed hybrid of platforming and action movie gymnastics. The spirits of Valve and Nintendo are alive and well at Respawn Entertainment, evidently. Read our review, and a breakdown of the best level. Purchase From: Available digitally from the Microsoft Store. Just as there must always be a Stark at Winterfell, there must always (apparently) be a Forza: Horizon game on our list of the best Xbox One games. Forza Horizon 4 uses the same winning formula that has worked so well for every preceding game in the series, spicing things up further with a ton of new cars and, most notably, weather that shifts with the seasons. It is, to paraphrase a wise man, “The Rolex watch of Hot Wheels playsets,” a game that looks amazing, feels wonderful to play, and will remind car-lovers everywhere why they love cars. A Good Match For: Car lovers, driving enthusiasts, those who like seeing immaculately rendered video game weather. Not A Good Match For: Those who haven’t enjoyed previous Horizon games; anyone who prefers open-world games that let you get out of your car and walk around; people hoping to see Toyota cars in a racing game. Watch it in action and hear our impressions of the game in the same video. There’s no shortage of ambition in The Witcher 3: Wild Hunt. Geralt of Rivia’s latest adventure is massive, a world you can get lost in for hours and still have plenty to do. And while many games these days have sprawling landscapes, The Witcher 3 is utterly dense. Every nook and cranny is filled with memorable characters, clever writing, and rewards for curious players. The main story is as thrilling as it is emotionally draining, and the side quests are actually worth doing! Best of all? You don’t need to have played a Witcher game to enjoy the heck out of the third. A Good Match For: Open-world fans, especially those who enjoyed Skyrim but were disappointed by the combat. In The Witcher 3, fighting is nearly as enjoyable as exploration. Not a Good Match For: People who value their time and social life, or those who prefer their games hyper-polished without any framerate drops or other nagging technical flaws. Read our review, and thoughts on the game’s (excellent) free DLC. Study our tips for the game, and catch up on The Witcher lore. Assassin’s Creed Odyssey takes all the role-playing-game elements introduced in last year’s Origins and expands on them significantly, adding a ton of fun new unlockable skills that will force players to actually focus on their gear and character builds. It also introduces a choice of male or female protagonists, as well as a branching dialogue system reminiscent of games like Mass Effect and The Witcher 3. Quests can have wildly different outcomes based on your decisions. It’s an entertaining tour of ancient Greece filled with adventure, romance, and more than a little myth. Just remember that whatever you choose to do, you’ll probably have to justify your choices to Socrates at some point. A Good Match For: Action-RPG fans, those who like games that mix stealth and combat, lovers of Greek history and mythology. Not A Good Match For: Those looking for a more traditional stealth-based experience along the lines of earlier Assassin’s Creed games, people who are afraid of eagles. It’s a fan-art generator. It’s pure cosplay fodder. It’s a meme machine, a water-cooler mainstay, and a cultural obsession. Overwatch is all of those things, but above all else it’s a finely tuned competitive video game that manages to encourage pitted competition and enthusiastic teamwork while ensuring everyone is having a good time. A Good Match For: Team Fortress 2 fans, people who liked banging action figures together as a kid, people who’ve wanted to try a competitive first-person shooter but haven’t yet found the right fit. Not A Good Match For: Anyone who wants to play offline, or who is hoping for a substantial single-player story campaign. Overwatch is strictly multiplayer-only. For years, the best way to understand why so many people love Monster Hunter games was to play one on a mobile device. With Monster Hunter: World, everything that makes Capcom’s long-running series so great is finally playable on a modern, big-screen gaming system. World takes advantage of that screen real estate, and the massive beasts you’ll fight look just as fearsome as you’d expect. World may be the most approachable Monster Hunter game yet, but it’s still a complex, rewarding game that you can play for hundreds of hours without running out of things to do. It’s fun to play solo, fun to play with friends, and basically just really fun. A Good Match For: Anyone looking for a thick, complicated game; those who like Dark Souls-style combat against huge enemies; people who’ve been intrigued by Monster Hunter and looking for a way to get into the series. Not A Good Match For: Those who want a game that’s straightforward and easy to get into; vegetarians. Update 11/12/2018: We’ve added Forza Horizon 4 and Assassin’s Creed Odyssey and taken off Gears of War 4 and Forza Horizon 3. Update 4/30/2018: We’ve added Monster Hunter: World and Fortnite Battle Royale while taking off Resident Evil 7 and Inside. Update 10/20/2017: We’ve added Cuphead and XCOM 2 and taken off Dark Souls 3 and Grand Theft Auto V.
Update 6/7/2017: We’ve added Gears of War 4 and taken off Destiny, which Bungie has been winding down in anticipation of the sequel later this year. Update 2/24/2017: We’ve added Resident Evil 7 and taken off Diablo 3. Update 12/21/2016: We’ve added Titanfall 2 and Hitman while cutting Ori and the Blind Forest and Metal Gear Solid V.
Update: 10/28/2016: We’ve cut Sunset Overdrive and Assassin’s Creed Syndicate and added Forza Horizon 3 and The Witness. Update 7/21/2016: Goodbye to Batman: Arkham Knight and Forza Horizon 2; hello to Overwatch and Inside. Update 2/27/2016: Fallout 4 and Dying Light come off the list, while Dark Souls 3 and Rise of the Tomb Raider make it on. Update 11/26/2015: Fallout 4 and Assassin’s Creed Syndicate make their way onto the list, edging out Dragon Age: Inquisition and Assassin’s Creed IV. We’re still keeping an eye on Halo 5’s to see if it’ll earn it a spot on the strength of its multiplayer. Update: 10/15/2015: We’ve added Metal Gear Solid V to the list and taken off Dark Souls II: Scholar of the First Sin. We’ve also updated our entry for Destiny to account for the Taken King expansion and cleared out old comments to make room for new ones. Update 7/16/2015: These swaps are getting harder. After much deliberation we cut Wolfenstein: The New Order, despite our affection for the surprisingly good story-driven first-person shooter. We’re also saying goodbye to another over-achiever, Shadows of Mordor, whose best trick, the Nemesis System, isn’t enough to keep it on our ever more competitive top 12. Update 5/5/2015: We’ve taken off Super Time Force, The LEGO Movie Videogame, and Rayman Legends to make room for Dying Light, Ori and the Blind Forest, and Dark Souls II: Scholar of the First Sin. Nearly half of the games on this list now begin with “D.” Mission accomplished. Update 11/25/2014: Three new games make their way onto the list: Dragon Age: Inquisition, Grand Theft Auto V and Sunset Overdrive edge out Ryse: Son of Rome, Dead Rising 3 and Titanfall. Update 10/17/2014: We’ve cleared out Tomb Raider: Definitive Edition, Plants vs. Zombies: Garden Warfare, and Need For Speed: Rivals to make room for Destiny, Forza Horizon 2, and Middle-earth: Shadow of Mordor. Update 8/29/14: Strider hops out of the way to clear space for Diablo III: Ultimate Evil Edition. Update 6/17/2014: The list continues to mature, as Metal Gear Solid V: Ground Zeroes and Peggle 2 leave to make room for Wolfenstein: The New Order and Super Time Force. Update 4/17/2014: Three games enter, two games leave. Our list hits its limit of 12 games, with Titanfall, The LEGO Movie Videogame and Metal Gear Solid: Ground Zeroes walking on while Powerstar Golf and LEGO Marvel Superheroes exit. Update 3/10/2014: Four games walk on to the list: Rayman Legends, Strider, Plants vs. Zombies: Garden Warfare and the newly multiplayer’d Peggle 2 bring our grand total of games up to eleven. One more and we’ll be at twelve, and will have to start cutting games to make additions. 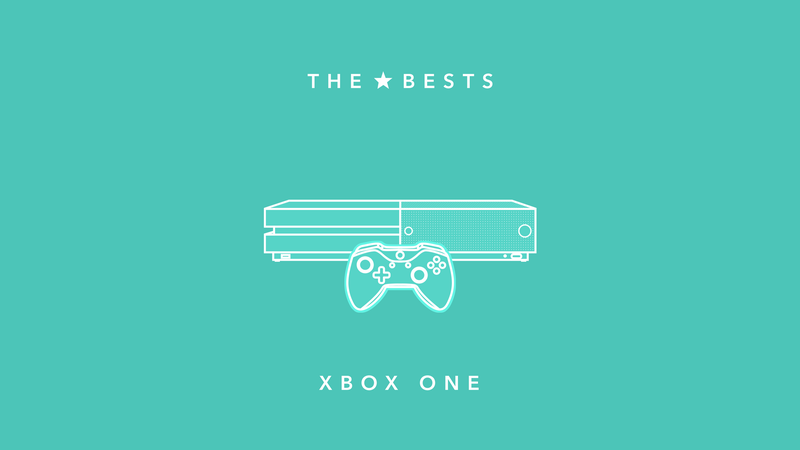 Update 2/14/2014: Our first addition to the Xbox One Bests list is the lovely-looking Tomb Raider: Definitive Edition. Go, Lara, Go. Note: While some games on this list are download-only, all of them can be purchased on the Xbox One’s online store. If you buy any of these games through the retail links in this post, our parent company may get a small share of the sale through the retailers’ affiliates program.